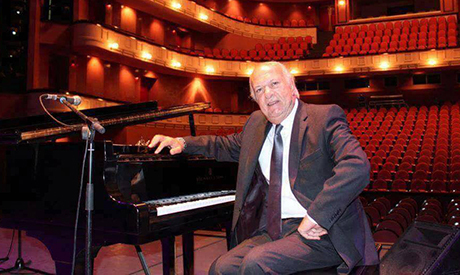 Renowned Egyptian pianist and composer Omar Khairat and his orchestra have announced that they will be holding a number of concerts in Cairo, starting with one at the Air Defence House on Friday 8 February. Khairat will then make a showing at his favourite hall at the Cairo Opera House on 18 and 19 February, as well as another two on 3 and 4 March. The 70-year-old Khairat, who performed in Saudi Arabia last month, is one of the most popular contemporary composers in the region. He has composed the scores for over 50 Egyptian films, including The Sixth Day (1984), The Terrorist (1993), Mafia (2002), Girl's Love (2003), The Embassy in the Building (2005) and Deer's Blood (2006). In television, his memorable works include Lailat El-Qabd Ala Fatma (1984) and Dameer Abla Hekmat (1991). He also composes music for theatre and special ceremonies, such as the opening of important Egyptian and regional cultural festivals. Khairat has also arranged compositions by celebrated Egyptian musician Mohamed Abdel-Wahab, releasing them as Wahabiat 1 and 2. His arrangements of Oum Kalthoum’s songs have also brought him acclaim.